This modern building offers a professional atmosphere with a mix of coworking and dedicated spaces. 24 hour access allows for your business complete tasks at anytime, day or night. This location offers access to a receptionist, equipped with all of the tools needed for your business. Located in the Ahwatukee neighborhood of Phoenix, AZ. Located near many of the neighborhoods best restaurants and bars. With a premier location in the heart of Phoenix’s most vibrant business area, these luxurious executive suites come fully equipped and serviced with professional onsite support staff. Also boasting incredibly views of the mountains and local scenery, nearby establishments include a movie theatre, gourmet restaurants, boutiques and a spa. 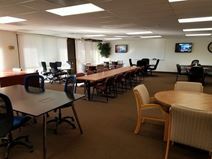 This space to rent affords clients all modern business amenities and conveniences. Set in the middle of Phoenix’s business hub, these new-build luxury suites offer clients secure underground parking, 24-hour access, an onsite fitness centre and trendy cyber café. With a superb selection of restaurants, shopping and transport options, these offices to lease provide the ultimate in professional convenience. This exquisitely furnished corporate office location and business center installation is set within one of the region's most prestigious and influential corporate districts, offering high quality and executive premium workspace solution packages to professional tenants in search of fully equipped, luxuriously supplied and impressive office space. The are also provides a range of excellent transport links. With beautiful views of the mountains of North Phoenix these private and co-working spaces are available on flexible terms and within close proximity of the Paradise Valley Mall. Located on the second floor of a two-story atrium building. This commercially significant and extensively supplied corporate location is a prestigious and technologically sophisticated business center, which comes fully equipped with a range of state of the art professional services and technical facilities to aid day to day business operations and to perfectly cater for any type of professional business requirement. The building is also easily accessible from anywhere in the area. This center is a great space for entrepreneurs and business owners. The building includes a bar, a coffee shop and several other food options. 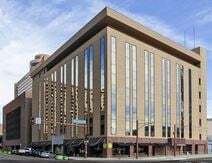 The building sits in the heart of downtown Phoenix and is in walking distance of 100+ restaurant and many entertainment options. Some of the amenities for this center include: kitchen, on-site management team, wifi, flexible terms, and hot desks. This center is located near Cafe's and restaurants and is a prime location for businesses to be around local attractions. This center is located near the home of the Phoenix Suns Basketball tea, and Diamondbacks Baseball team. Those are both great attractions for clients or team outings. Be sure to check out any of the hot restaurants on lunch or after a long day winding down. Union Station is less than a 15-minute walk from this exquisitely furnished and highly prestigious business center, ideal for commuters and visitors can arrive with ease, as Phoenix Sky Harbor International Airport (PHX) can be reached in a 10-minute drive, or a 15-minute ride on public transport. Any visitors can also make use of the various hotels nearby, such as the very well located Kimpton Hotel Palomar Phoenix. A fantastic range of executive, multi-room suites provide dazzling views of the mountains and surrounding landscape. Including three internal meeting rooms for convenient onsite meetings, these office spaces are in one of the most sought-after locations right in the centre of downtown Phoenix. Clients also have easy access to the huge collection of hotels, movie theatres, boutiques and fine dining establishments. This exquisitely furnished and fully functional business center installation is a premium and contemporary corporate venue and conferencing destination, ideal for any type of professional occupant to benefit from its extensive selection of business facilities and wide range of fully functional and highly diverse workspace solution packages, which provide a flexible and variable working environment ideal for any type of business requirement. Ultra-luxurious offices to lease with stunning array of benefits, including breathtaking mountain views, an onsite deli, hair salon and health club, and the latest in technology. Nestled in a prestigious suburban community, clients can take advantage of the impressive variety of fine dining establishments, close proximity to hotels and the local golf course.